Enough with the follow/unfollow strategy or liking photos until your thumb loses feeling. What is their was another way (like 4 or 5) to increase your brand’s exposure on Instagram? 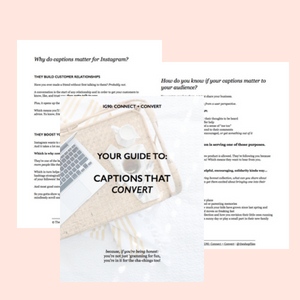 Like a way to gain new Instagram followers while also creating valuable content for your audience AND building stronger relationships with other businesses? Today, we’re talking about how you can use the power of other accounts to naturally increase your Instagram exposure to a new audience. Essentially, we’re going to work at “borrowing” their audience. Create a flatlay that uses other brands to complement your product and pull together a more complete collection for your audience. Tag the other shops featured in your image; both in the photo + caption; and bonus if you include a call out with a reason to go check them out. The key to this method (and many of the others) is that your brand naturally lines up with the accounts you’re tapping into. If it’s not a natural fit, the additional exposure wouldn’t earn you targeted followers or exposure to your ideal audience. So if your shop is all about minimalism and soft neutrals, don’t try to work with brands that feature bright colored products – it doesn’t work for your feed and it won’t work for theirs (meaning they’d be less likely to feature you anyway). *Remember to use their brand hashtag if they have one! Many brands will specifically search for posts within their hashtags to re-grame. partial #spoileralert to #2 below! Again, focus here on hashtags that already align with your brand. So using that same shop example of minimalism and soft neutrals, don’t try to work with hashtag communities or try to create shots with brightly colored images just so you can “get in their feed” or be re-grammed. If you’re looking for some community-based hashtags to get started, check out #3 on this post. You want to be sure you’re staying true to your feed and ideal audience for this one. The image needs to fit and look cohesive in your feed; and the content needs to be something your ideal audience would be interested in. Share your message and add in a call to action to go check them out in your caption. Also be sure to tag them in the photo and make it clear the photo credit is theirs. Crushing on @shop this week! we all know us mamas love some flowy tops and their super soft cotton tees are perfection. I could stay in mine all weekend! go check them out now >>> @shop! Potential Exposure: This method is a great way to get noticed by accounts you’d like to partner with in the future or who you think would really love your shop and just want them to become aware of your brand. The tag in the photo will alert them with a different notification as it will also appear in their “photos of you” section. PS. This is not permission to start randomly tagging accounts in your photos. Tagging should only be to give proper photo credit and when using someone else’s photo strategically to round out your feed. In this method, each brand would send the other an image to share or have them pick one from your current feed. For both sides to have a good experience, it’s really important to determine the goal of your swap – is it a brand shoutout? Are you asking them to promote something specific? Also be sure to set guidelines of the what/when to post so no one feels like they got a bad deal. This strategy generally works best when partnering with accounts of a similar size, but don’t be afraid to stretch upwards. Allie from @AnnRevereJewelry has had insane success working with Instagrammers up to 35 times her size! Potential Exposure: One of the most guaranteed exposure methods of the five; provided you’ve chosen an account that gets good engagement and is likely to have followers that match your similar customer base. If you’re not sure where to start with hashtags, be sure to check out my guide on How to Find the Best Hashtags for your Business (plus 70+ hashtag ideas) or grab your copy of the Hashtag Discovery Workbook! Pick one of the above strategies and try it THIS WEEK. If you’re still figuring out your Instagram theme, join the free Find Your Feed challenge to kick start some new ideas. In three days you’ll have your very own 9-grid template so you know exactly what to post! Very nice! I’m going to try some of these for my fashion instagram page. Always looking to connect with other accounts, still one of our favorite ways to grow. Great advice that we will definitely try on here though on our @profitingtools account. Thank you so much for this. I’m a new blogger so I need all the tips I can get. These are truly some of my favorite tips, good luck using them! You got this! !